Cedar’s already extensive product range of high quality hot tubs. 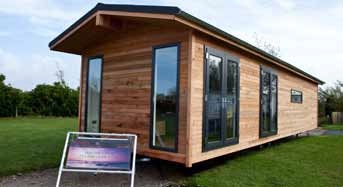 Hot tub specialists Urban Cedar have branched into the holiday lodge market with the launch of their brand new holiday home lodge. The luxury Urban Cedar Home features a contemporary design, cedar galley style kitchen, solid oak flooring and Bosch appliances. The first lodge is sited at The Retreats, a brand new development of just 25 lodges located at Padstow Holiday Park in Cornwall. The 40 x 12ft lodge is finished with galvanised steel and cedar decking and steel gabions filled with local Cornish stone. Antony Perry, managing director at Bristol-based Urban Cedar explains: “A key feature we wanted to create within the lodge design was space. When the master bedroom door is open you can see from one end of the lodge to the other. The lodge design can be adapted to suit all size requirements and bespoke features can also be added.